Melia is an amazing, funny, smart, happy eight year old little girl. Melia also has autism and issues with wandering. Melia, like 90% of all children with autism is extremely drawn to water. This is a very big concern for her family. Melia doesn't have a sense of danger typical kids her age do. For example,while playing outside Melia will run into the street without thinking about it. Melia will try to go outside without her parents, not realizing how dangerous it is to do that. There are special locks and alarms on all of the doors in Melia's home to alert her parents if she gets out. A service dog,however, would be able to STOP Melia from escaping, would move her away from dangers such as the street and if Melia somehow got away the dog will be trained to search and rescue her as well. The dog will help keep her calm in situations which are stressful to her such as crowds and keep her out of dangerous situations.The dog will also be trained to calm Melia in cases where a situation causes a meltdown. This dog will be a huge help in Melia's life, but we need YOUR help! 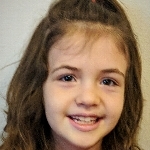 PLEASE consider donating to this campaign and share with your friends and family, if we all work together we can make this happen for this amazing little girl! SDWR Autism Service Dogs are trained to help with better sleeping patterns ,making meltdowns less frequent , better reading skillsets , redirection away from repetitive behavior , and even in severe cases they can be trained to find a child if lost. These are just a few things of the many that these dogs can do! Please watch some videos at the link below to see some other families who have service dogs for their children with autism to see how much they impact the child's life in a positive way! the next step in providing a solid base between a service dog and the recipient. Your donation goes to the placement and growth of more life-saving service dogs. SDWR is a fully incorporated 501(c)3 non-profit organization and all donations are tax deductible Our program gives those with an invisible illness a chance at their own service dog. As a non-profit, we offset the costs of investing in an assistant dog. We believe no one should have to pay for a service dog. Through fundraising opportunities and our donors, we work to make service dogs for the disabled a reality. Service Dogs by Warren Retrievers helps families find local resources to help offset the costs associated with the training of a service dog. All donations go to the placement of service dogs and the needs of our mission.